After drinking ionized alkaline water for 30 days, these blood cells from Ronnie Ruiz (former CEO of Chanson Water® USA) still reveal unhealthy signs. 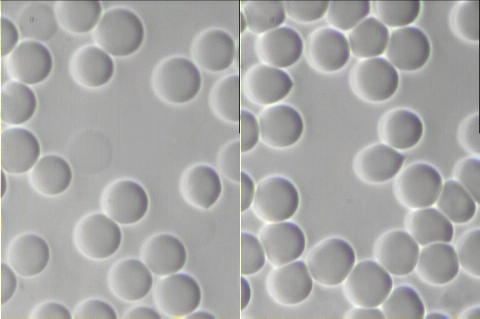 Here we see yeast cells and red blood cells with white spots inside – which is indicative of a diet that is too high in carbohydrates and simple sugars and an acidic imbalance in the body. 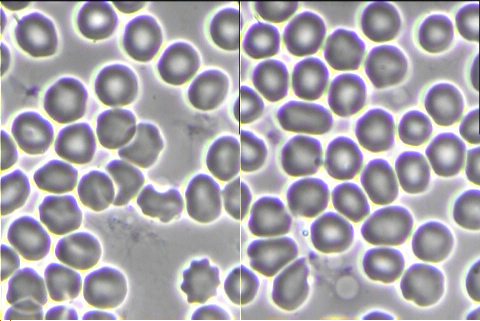 We also see some red blood cells that look like bottle caps. This is a more significant indication of latent tissue acidosis at the cellular level, revealing the body’s inability to remove acid waste. Acid builds up, causing cells to eventually break down. This blood is not healthy. After 18 months of drinking ionized alkaline water on a daily basis, Ronnie’s very healthy blood cells are shown. Please note, it doesn’t take 18 months to make this dramatic change. This was simply the lapse of time between the two tests. Red blood cells are no longer malformed and showing acidic breakdown.